Last year, the carbon footprint of firms listed on Nasdaq Helsinki fell by 16% on the previous year. Last year, the carbon footprint of firms listed on Nasdaq Helsinki fell by 16% on the previous year. A million-euro investment in the listed companies in Helsinki produces 199 tons of carbon dioxide emissions (tCO2e), while last year the corresponding figure was 236 tCO2e. Within two years, the emissions have fallen by one third. This is the finding of the third such study commissioned by Sitra. The significant change shows that the efforts made by Finnish companies to reduce emissions are yielding results. The study being published today compares the carbon footprint of companies listed on Nasdaq Helsinki to key comparison indices. The study shows that the carbon footprint of Nasdaq Helsinki continued to go down from last year, but still exceeds the carbon footprint of Nasdaq Stockholm and other key international indices, such as the MSCI World and Eurostoxx 50. However, it is below the German DAX and the French CAC40 indices. The difference between Helsinki and Stockholm is explained by the fact that Nasdaq Stockholm places high emphasis on low-carbon sectors, such as financials and consumer goods, whereas for Nasdaq Helsinki utilities and the industrials and materials sectors increase the overall emissions. “Compared to the previous year, the figures have continued to go down steadily. A drop of more than 15 per cent in emissions two years running is a great achievement,” says Janne Peljo, Project Director at Sitra. It is also important to note that the emission data is based on emissions reported in the past. “Full benefits from the analysis of emission data can be obtained when the companies in the same industry are compared and attention is paid to how companies have taken climate change into account in their strategies,” Peljo continues. 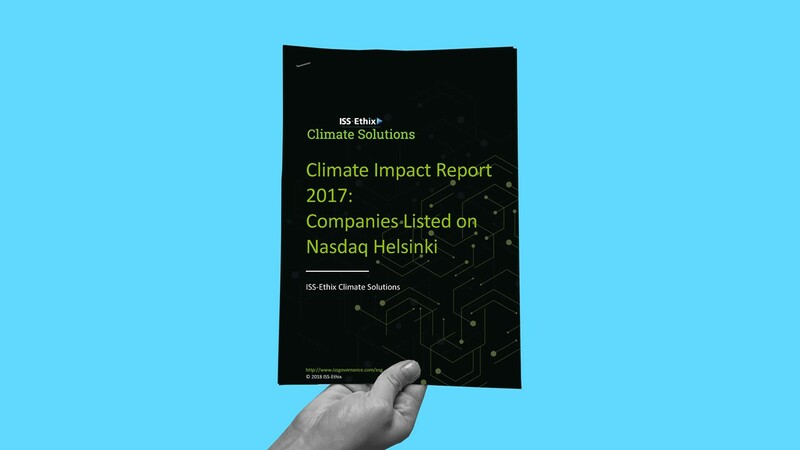 Even though only 31% of the companies listed on Nasdaq Helsinki report their greenhouse gas emissions, in terms of the stock exchange’s market cap the figure rises to 93%. Sweden falls behind Finland on both counts, since only 27% of the companies listed on Nasdaq Stockholm, representing 82% of the stock exchange’s market cap, report their emissions. On the other hand, both Nordic stock exchanges fall behind major international indices benchmarked in the study, where a majority of companies report their emissions. “It is natural that major corporations are the ones investing in the compilation and reporting of emission data, as their investor base often includes international institutional investors. On the other hand, large companies have an opportunity to allocate resources for this, but reporting is also required by institutional investors. Finnish companies still have some room for improvement in this respect,” says Peljo. In connection with the carbon footprint study, the “do-it-yourself” investor tool for carbon footprinting has also been updated. It allows investors to estimate the relative carbon footprint of their own holdings in Finnish listed companies, namely the amount of carbon dioxide emissions created in relation to the company’s market cap and the ownership share of the investor. Today, investors pay increasing attention to the impacts of climate change in their investment portfolios, with particular focus on the risks caused and opportunities offered to companies by climate change. Several international initiatives and frameworks have been developed for the purpose of taking account of climate risks in investments. One of the most prestigious among them is the Task Force on Climate-related Financial Disclosures (TCFD) set up by Mark Carney, Governor of the Bank of England, and chaired by Michael Bloomberg, the former Mayor of New York City. Final Report: Recommendations of the Task Force on Climate-related Financial Disclosures, published by the TCFD last June, underscores the importance of understanding the climate change-related physical and transition risks from the viewpoints of both companies and investors. Climate change causes physical risks to companies’ business operations, but the risks caused by the transition to a low-carbon economy play a significant role in emission-intensive sectors in particular. For example, the growing pressure to reduce emissions from energy production and the rapidly falling costs of renewable energy have raised questions about the future outlook for coal power. By contrast, the mitigation of climate change opens significant business opportunities in various sectors. “In the future, climate change and its impacts will cause major shifts in the operating environment of companies. Therefore, it is worthwhile for long-term investors to make the assessment of climate change-related risks and opportunities an integral part of the traditional portfolio analysis, as the pioneers have already begun to do both globally and in Finland,” Janne Peljo points out. To take account of climate risks, investors need to compare their investments to various climate scenarios and assess both the physical and transitional climate change-related risks, while also assessing the opportunities arising from the transition to a low-carbon economy. The recommendations given by the TCFD provide an excellent framework for such analysis. When the recommendations were published, financial institutions with assets under management amounting to more than USD 25 trillion and 100 companies with a combined market cap of USD 3.5 trillion announced their support for the initiative, which is expected to significantly influence the future actions of investors and companies. Practical advice on how to take account of climate change in investment activities will also be provided by the guidebook “Sijoittajan opas ilmastoriskien hallintaan” (An investor’s guide to managing climate risks; link in Finnish), compiled by WWF Finland, Mandatum Life and Sitra, and which is also being published today. Download the report and the Screening Tool. User guide for the screening tool is attached to the report. Please note that the tool will only work, if the use of macros is accepted, when opening the file. Presentations from the report launch can be found here.